This very amusing legal scene depicts dogs in a courtroom. A large white poodle sits at the centre, parodying a judge in his white wig, a paw upon the statute book. From the palace down, Victorian society was embracing the trend for dogs to be kept just as much as domestic amusements as working animals. Victoria and Albert had many of their pet dogs painted and engraved by Landseer and where the queen led others followed. The original painting, exhibited at the R.A. in 1840, was bought by the Duke of Devonshire and remains at Chatsworth. The Landseer family was quite a force to be reckoned with in mid nineteenth century London's art world. 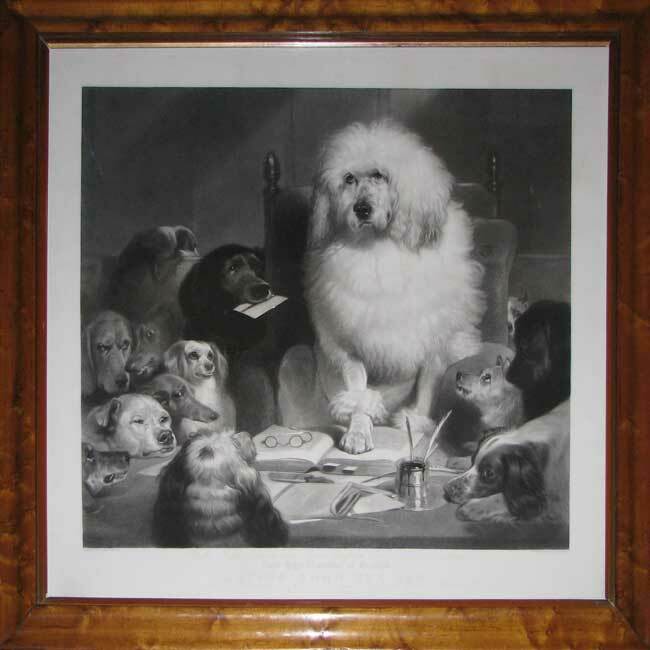 The father, John Landseer, was a painter and engraver who taught both his sons and also fought hard to gain recognition for engravers at the Royal Academy of Arts. The boys, Thomas and Edwin, both excelled in their professions and Edwin Landseer went on to become arguably the most famous animal painter of the Victorian era.